Aaron Cook can compete for Moldova in taekwondo after the British Olympic Association (BOA) reluctantly agreed to his request to switch nations. Cook, 24, competed for Team GB at the 2008 Olympics, but was overlooked for London 2012, despite being ranked world number one at the time. "We are saddened by Aaron's decision," said BOA chief executive Bill Sweeney. "Despite the fact that there is no legitimate case for nationality change here, the BOA cannot compel any athlete to represent the United Kingdom against his or her will." The Olympic Charter rules that three years must pass between an athlete representing one nation before switching to another. 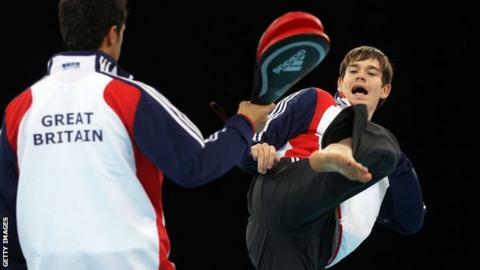 Cook left the GB Taekwondo set-up in 2011, a move he believed - and GB Taekwondo has always denied - was behind his Olympic snub. The Dorset-born 24-year-old insisted he would never compete for Britain again while performance director Gary Hall and chairman Adrian Tranter, whom he held responsible, were still in charge. The fighter instead represented the Isle of Man and although the BOA, UK Sport, GB Taekwondo and representatives from Cook's team have met on several occasions, no common ground to rebuild the relationship was found. GB Taekwondo chairman Jeremy Beard said: "We have made exhaustive efforts to engage with him and his team for some time but sadly it seems he has made the decision that his future lies elsewhere." Cook has no family links to Moldova but had been actively looking for another nation to represent to enable him to go to the 2016 Olympics. Costa Rica, France and Turkey had been seen as potential destinations, though Cook insisted he would only move to another nation with no -80kg fighter to avoid depriving someone of the chance to represent their country of birth at an Olympics. He has already received his passport for the East European state and revealed in a statement earlier this month that he felt he had "no other option" but to move. One of his primary concerns was said to be the lack of clarity over selection criteria for the Rio Olympics, fearing he would again be overlooked despite being the highest ranked -80kg fighter. It is understood an independent representative and a member of the BOA must now be part of future GB Taekwondo selection processes - but this was not enough to appease Cook, who was set to be named as Team GB's -80kg representative at the inaugural European Games in Baku in June. "We strongly urged Aaron to re-consider his decision and to make himself available for selection to Team GB in Baku," added Sweeney. The leading contenders to be the sole -80kg British fighter at the Rio Olympics are London Olympic bronze medallist Lutalo Muhammad - who is ranked world number four - and Damon Sansum, who is currently eighth in the global standings. Cook's first competitive fight for Moldova is expected to be at the World Championships in Chelyabinsk, Russia, in May.